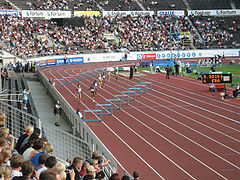 The 400 metres hurdles is a track and field hurdling event. The event has been on the Olympic athletics programme since 1900 for men and since 1984 for women. On a standard outdoor track, 400 metres is the length of the inside lane, once around the stadium. Runners stay in their lanes the entire way after starting out of the blocks and must clear ten hurdles that are evenly spaced around the track. The hurdles are positioned and weighted so that they fall forward if bumped into with sufficient force, to prevent injury to the runners. Although there is no longer any penalty for knocking hurdles over, runners prefer to clear them cleanly, as touching them during the race slows runners down. The best male athletes can run the 400 m hurdles in a time of around 47 seconds, while the best female athletes achieve a time of around 53 seconds. The current men's and women's world record holders are Kevin Young with 46.78 seconds and Yuliya Pechonkina with 52.34 seconds. Compared to the 400 metres run, the hurdles race takes the men about three seconds longer and the women four seconds longer. The 400 m hurdles was held for both sexes at the inaugural IAAF World Championships in Athletics. The first championship for women came at the 1980 World Championships in Athletics – being held as a one-off due to the lack of a race at the 1980 Summer Olympics. The first awards in a 400 m hurdles race were given in 1860 when a race was held in Oxford, England, over a course of 440 yards (402.336 m). While running the course, participants had to clear twelve wooden hurdles, over 100 centimetres tall, that had been spaced in even intervals. To reduce the risk of injury, somewhat more lightweight constructions were introduced in 1895 that runners could push over. However, until 1935 runners were disqualified if they pushed over more than three hurdles in a race and records were only officially accepted if the runner in question had cleared all hurdles clean and left them all standing. The 400 m hurdles became an Olympic event at the 1900 Summer Olympics in Paris, France. At the same time, the race was standardized so that virtually identical races could be held and the finish times compared to each other. As a result, the official distance was fixed to 400 metres, or one lap of the stadium, and the number of hurdles was reduced to ten. The official height of the hurdles was set to 91.4 cm (3 feet) for men and 76.20 cm (2 ft, 6 inches) for women. The hurdles were now placed on the course with a run-up to the first hurdle of 45 metres, a distance between the hurdles of 35 metres each, and a home stretch from the last hurdle to the finish line of 40 metres. The first documented 400 m hurdles race for women took place in 1971. The International Association of Athletics Federations (IAAF) introduced the event officially as a discipline in 1974, although it was not run at the Olympics until 1984, the first Men's World Champion having been crowned the year before at the inaugural IAAF World Championships in Athletics. A special edition of the Women's 400m Hurdles happened in the 1980 IAAF World Championships in Athletics in response to the Women's 400m Hurdles not being included in the boycotted 1980 Moscow Olympics and the Liberty Bell Classic. Many athletic commentators and officials have often brought up the idea of lifting the height of the women's 400 m hurdles to incorporate a greater requirement of hurdling skill. This is a view held by German athletic coach Norbert Stein: "All this means that the women's hurdles for specialists, who are the target group to be dealt with in this discussion, is considerably depreciated in skill demands when compared to the men's hurdles. It should not be possible in the women's hurdles that the winner is an athlete whose performance in the flat sprint is demonstrably excellent but whose technique of hurdling is only moderate and whose anthropometric characteristics are not optimal. This was the case at the World Championships in Seville and the same problem can often be seen at international and national meetings." "The 400m hurdle race one of the most demanding of all events in the sprint-hurdle group." (Lindeman) It requires speed, endurance, and hurdling technique all along with unique awareness and special concentration throughout the race. When preparing to hurdle, the blocks should be set so that the athlete arrives at the first hurdle leading on the desired leg without inserting a stutter step. A stutter step is when the runner has to chop his or her stride down to arrive on the "correct" leg for take off. Throughout the race, any adjustments to stride length stride speed should be made several strides out from the hurdle because a stutter or being too far from the hurdle at take off will result in loss of momentum and speed. At the beginning of the take-off, the knee must be driven toward the hurdle and the foot then extended. The leg position when extended must be stretched out, in a position of a split. The knee should be slightly bent when crossing the hurdle. Unless an athlete's body has great flexibility, the knee must be slightly bent to allow a forward body lean. Unlike the 110m hurdles, a significant forward body lean is not that necessary due to the hurdles being lower. However, the trail leg must be kept bent and short to provide a quick lever action allowing a fast hurdle clearance. The knee should pull through under the armpit and should not be flat across the top of the hurdle. It is also important that the hurdler doesn't reach out on the last stride before the hurdle as this will result in a longer bound being made to clear the hurdle. This will also result in a loss of momentum if the foot lands well in front of the center of gravity. Using a left lead leg on the bends allows the hurdler to run closer to the inside of the lane and cover a shorter distance. Additionally, if the left leg is used for the lead, then the athlete's upper body can be leaned to the left, making it easier to bring the trail leg through. Additionally, an athlete hurdling with a right leg lead around the bends must take care that they do not inadvertently trail their foot or toe around the hurdle rather than passing over the top, which would lead to a disqualification from the race. Depending on the height and strength of the athlete, men work toward a stride pattern of 13 to 15 steps between each hurdle, and women work toward a stride pattern of 15 to 17. This does not include the landing step from the previous hurdle. Weaker athletes will typically hold a longer step pattern throughout the race so that they do not bound or reach with each step, which also results in a loss of speed. These patterns are ideal because it allows the hurdler to take off from their predominant leg throughout the race without switching legs. However, fatigue from the race will knock athletes of their stride pattern and force runners to switch legs. At an early age, many coaches train their athletes to hurdle with both legs. This is a useful skill to learn since as a runner tires, their stride length may decrease, resulting in the need either to add a stutter stride, or to take a hurdle on the other leg. The 400 metre hurdles is a very physically demanding race. It requires intense training to get the endurance, speed and technique needed to compete. Below is a list of all other times superior to 52.88. Lashinda Demus ran 52.63 (2009), 52.77 (2012), 52.82 (2010). Melaine Walker ran 52.64 (2008), 52.73 (2011). Kim Batten ran 52.74 (1998), 52.84 (1998). Faní Halkiá also ran 52.82 (2004). Dalilah Muhammad also ran 52.88 (2016). American athlete Glenn Davis had a prodigious start to his hurdling career, running his first race in April 1956 in 54.4 s. Two months later, he ran a new world record with 49.5 s and later that year he won the 400 m hurdles at the Olympics, and was also the first to repeat that feat in 1960. In terms of success and longevity in competition, Edwin Moses' record is significant: he won 122 races in a row between 1977 and 1987 plus two gold medals, at the 1976 Summer Olympics in Montréal and the 1984 Summer Olympics in Los Angeles. He was undefeated for exactly nine years nine months and nine days, from 26 August 1977 until 4 June 1987. The U.S. boycott of the 1980 Summer Olympics in Moscow prevented him from winning a hat-trick of gold medals, but his career is nonetheless widely regarded as one of the most successful in hurdling. He finished third in the 1988 Olympic final, the last race in his professional career. He also held the world record for sixteen years from when he first broke it at the Olympics on 25 July 1976 (twice in one day) until it was finally broken by Kevin Young at the 1992 Summer Olympics in Barcelona. Note: Edwin Moses and Kevin Young are the only male 400 m hurdlers to have been Olympic Champion, World Champion and broken the World Record. Note: Sally Gunnell is the only female 400 m hurdler to have been Olympic Champion, World Champion and broken the World Record. The official IAAF World Championships in Athletics began in 1983, but in 1980, the women's 3000 metres and 400 metres hurdles events had a World Championship competition in Sittard, Netherlands. This was due to these events not yet being on the Olympic program (the same had happened in 1976 for the men's 50 km walk). ^ "400 Metres Hurdles Men All Time". IAAF. ^ "400m Hurdles Results" (PDF). sportresult.com. 30 June 2018. Retrieved 1 July 2018. ^ "400m Hurdles Men Final Results" (PDF). EAA. 9 August 2018. Retrieved 11 August 2018. ^ "400 Metres Hurdles Women All Time". IAAF. ^ Roy Jordan (25 June 2017). "Muhammad wins historic 400m hurdles race at US Championships". IAAF. Retrieved 26 June 2017. ^ "400 Metres Hurdles Results". IAAF. 8 August 2012. Retrieved 9 August 2012. ^ Jon Mulkeen (14 May 2018). "McLaughlin smashes own world U20 400m hurdles record with 52.75 in Knoxville". IAAF. Retrieved 14 May 2018. ^ IAAF World Championships in Athletics. GBR Athletics.